I love the tang of citrus so after discovering the amazing properties of Agar Flakes, I couldn’t resist making a Lemon & Lime Mousse. It’s light and summery, plus being dairy, sugar, wheat, gluten and egg free its friendly for a whole host of dietary requirements as well as being suitable for vegans and vegetarians. Pour rice milk and apple juice into a saucepan and add the agar flakes, leave agar to soak for 10 minutes until it softens (note – the rice milk will split slightly when adding the apple juice – this is okay, blending the mousse later in the recipe removes this). Place the saucepan on the hob and gently boil, leave to simmer until agar flakes melt (approx. 10 minutes). Meanwhile, mix the arrowroot powder with 2 tablespoons of cold water. Once the agar flakes have melted, add the pinch of salt followed by the arrowroot paste to the pan and stir occasionally until the mixture thickens (similar to the consistency of custard). Remove from the heat, add the remaining ingredients – lemon / lime juice, agave nectar, lemon / lime rind and mix thoroughly. Taste and adjust to required taste if necessary. Pour the mixture into a shallow, wet bowl and place in the fridge for an hour to set. After an hour, pour the mixture into the food processor and blitz until light and smooth. Pour into glasses / ramakins and leave in the fridge until ready to serve. The mousse will keep in the fridge for 2 – 3 days. 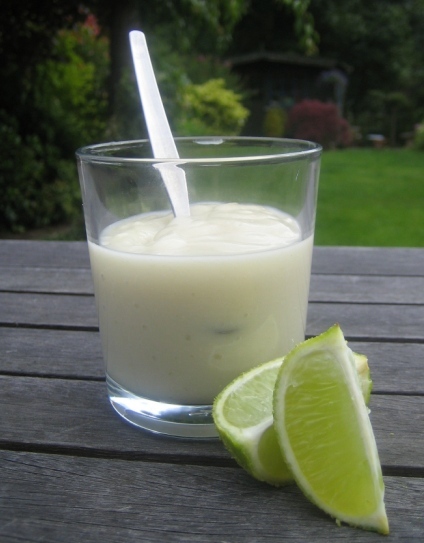 Great for a light refreshing treat on a warm summers day, Lemon & Lime Mousse is a real hit. This lemon and lime mousse would be great as the filling for a lemon meringue pie, or on top of a cheesecake style base (see our Free From Lemon Moussecake recipe, or simple serve with some fresh raspberries, strawberries, blueberries and blackberries or with a good dollop of soya / oatly cream. Morning – looks great might have to give that a try this week. I’m going a bit mousse manic at the moment and have just made a coconut mousse with the half a can of coconut milk I had leftover from my thai curry at the weekend. I wasn’t too sure how it would turn out but its actually really quite good (its still chilling in the fridge but I couldn’t resist dipping my spoon in for a quick preview)! It should set properly just intime for dessert so I’m going to have some with a few pieces of fresh mango.